Here at URB-E, we know how fun it is to take our vehicles out just for joy rides around town. There’s a thrill that comes with riding at top-speed with the wind blowing through our hair. That being said, there’s a lot more to do with this electric transportation device than taking it for a spin around town. Here’s how we, members of the team, use our URB-Es. Our work commute has to be number one when it comes to ways we use our URB-Es. Some of us live in Pasadena or nearby USC, so riding the mile or two to work takes no more than ten minutes. However, some of us aren’t as fortunate to live in a short radius of our workspace. 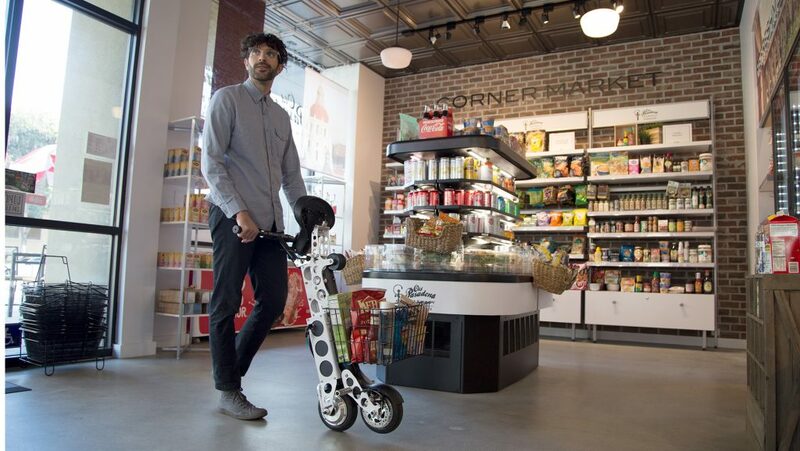 Instead of sitting in the brutal L.A. traffic, we take our URB-Es that short distance to our nearest metro stop, fold it up, and hop on the train to our destination from which we ride our URB-Es to the store. Although we like to consider URB-E as closely connected to USC, some of us are actually current members of the Trojan Family. Now that URB-E has found a home in the USC Village, it is incredibly easy to ride from class, to the sorority house, to get dumplings on Figueroa, and back to the village. Whether rented or owned, our URB-Es are improving the lives of students and faculty alike here at USC. It may not be the purpose you originally associate with URB-E, but hear us out. By attaching on of our baskets to your vehicle, we have successfully created the perfect portable shopping cart. Ride to the grocery store, fold up our URB-Es, and roll them through Trader Joe’s on the way home from work or class to pick up our dinner for tonight. Then, all we have to do is unfold and ride home! Using the URB-E when we go shopping is so much easier than finding, and then paying, for a parking space at pretty much any retailer. These are just a few of the ways that we’re using our URB-Es in everyday life. That’s not to say we’re not innovating and always finding new places and adventures to take our vehicles!